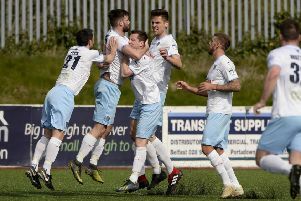 Ballymena United have placed striker Jonathan McMurray on the transfer list ahead of the window opening in January. The Sky Blues confirmed on Sunday they were 'open to receiving offers' for the front man, and revealed they have received a "number of enquiries" over the past six months. Larne are one of the clubs believed to have an interest in the 24-year-old. Ballymena boss David Jeffrey clarified the situation on the club website following talks with the player this week. “It has always been the policy for Bryan and myself to keep our playing staff under constant review and when we think it is appropriate to offer contract extensions we will do just that - as this season already has seen with Cathair Friel, Leroy Millar, Ross Glendinning and Kofi Balmer. "In keeping with this policy we spoke to Jonathan and he was very open and honest that at this time he didn’t want to go into negotiations but would like to wait until January to review the full options available to him. "Over the past six months we have received a number of enquiries and verbal offers, however, at that point we weren’t prepared to let him go, but having spoken to Jonathan we wish to be open and transparent with all concerned. "There are constant rumours about where he may or may not being going, so we feel it is appropriate and in the best interests of the club and the player to say that he is available for transfer. "This will remove any smoke and mirrors for clubs who are interested and allow for openness around their intentions. "Bryan (McLoughlin) and I identified his talent at Warrenpoint and brought him here to develop him further as a player, and it is still very much our hope that Jonathan feels his future will be here at the Showgrounds.